Pan Green political leaders on Taiwan are feeling something they haven't felt in a long time -- sheer panic. Taiwan independence Political Correctness, the bedrock foundation of Pan Green political power beneath the Taiwan independence nomenklatura's feet, has suddenly turned into quicksand. Taiwan independence Political Correctness, the all-powerful talisman against their hated Pan Blue opponents, has suddenly lost its mana. Pan Blue political leaders on Taiwan, meanwhile, are also feeling something they haven't felt in a long time -- newfound confidence. Pan Blue spokesmen, once terrified of being painted red with a broad "Chinese Communist fellow traveler" brush, no longer bite their tongues in the face of Pan Green McCarthyite name-calling. Instead, they fire back, loudly and unapologetically, confident of a fair hearing from a disillusioned public that no longer believes the Taiwan independence nomenklatura's Big Lies. The 17 year long witch hunt conducted by the Taiwanese counterparts of Joe McCarthy is over. 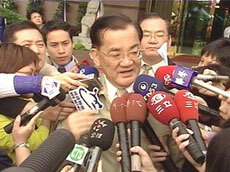 It ended with Hsu Wen-long's public renunciation of Taiwan independence on March 25, 2005. In this sense, Taiwan in 2005 is like the US in 1954, when US Army Attorney General Joseph Welch broke the spell of McCarthyism with his famous rebuke: "Have you no sense of decency, sir? At long last, have you left no sense of decency?" Not only are Pan Blue leaders no longer meekly acquiescing to Pan Green intimidation, they are adopting bold initiatives to promote Chinese reunification, in accordance with the Republic of China Constitution and Pan Blue core values. The centerpiece of these Pan Blue initiatives is KMT Chairman Lien Chan's upcoming "Journey of Peace," during which he will travel to Beijing and participate in a summit meeting with CCP General Secretary Hu Jintao. Lien's trip, the first official contact between the two parties in 56 years, will truly make history. Lien's trip cannot be dismissed as a mere photo op. Lien Chan solemnly promised as part of his presidential campaign last year to make just such a "Journey of Peace" in the event he was elected. Lien is merely following through on his promise, having been unavoidably delayed by Chen Shui-bian's Wag the Dog "assassination attempt" and subsequent defacto coup d'etat. PFP Chairman James Soong, meanwhile, has been jumping up and down screaming "Me too! Me too!" Soong would have been an integral member of Lien's historic first-ever delegation, but Soong dealt himself out of the game by reneging on his promise to merge with the KMT following the December 2004 Legislative Election. Instead Soong opportunistically cast his lot in with the DPP, betraying the PFP's Pan Blue supporters for myopic, short-term political advantage. Soong, as a result, will be the second political party leader to visit Beijing. That's a little like being the second man to set foot on the moon. Everyone remembers the first man to set foot on the moon. Nobody remembers the second. For the record, it was Buzz Aldrin. Sorry James, but you did it to yourself. The DPP's counterfeit president Chen Shui-bian, who wants the same red carpet treatment for himself so badly he can taste it, wasn't even invited to the party. He won't be, not until the Taiwan independence clause is stricken from the DPP Party Constitution. Chen, green with envy, is gnashing his teeth, sputtering that "The grapes were sour anyway!" Chen is threatening to arrest Lien Chan and toss him in prison for "high treason." Despite such dictatorial threats from the unelected, illegal Chen regime, Lien, the actual winner of the 2004 Presidential Election, has courageously refused to back down. Lien Chan, to almost everyones' surprise, has emerged from Lee Teng-hui's dark shadow and matured into a far-sighted and level-headed political leader. Naked intimidation against the True Blue Lien Chan having failed, Chen Shui-bian is attempting to spin James Soong's trip to Beijing as his own. Chen and Soong, these two unprincipled, opportunistic birds of a feather, are attempting to spin Lien Chan's trip as "nothing more than a low-level party to party exchange between the KMT and CCP," and James Soong's trip as "the government's officially authorized, high-level state to state exchange between the ROC and PRC." Good luck with that. Talk about self-delusion. Whom do they think they are fooling? Certainly not Pan Blue voters on Taiwan. Certainly not CCP leaders in Beijing. They are only fooling themselves and their most pathetically gullible True Believers. The media on Taiwan has coined a name for this unapologetic scramble by the KMT, PFP, and even the DPP to "deng lu" (establish a beachhead on the mainland). They are calling it "mainland fever" or even "China fever." What is mainland fever or China fever? Mainland fever or China fever is not the grudging admission that "Taiwanese" have no choice but to do business with "Chinese" to prosper financially. Mainland fever or China fever is the liberating awareness that the Taiwan independence nomenklatura's artificially manufactured "emerging Taiwanese national identity" is neither politically achievable nor objectively desirable. High-priced Taiwan independence spin-doctors such as Cassady and Associates have successfully convinced many Americans that cross-straits tensions are a result of sheer cussedness on the part of mainland China. If only mainland China would leave Taiwan alone, they believe, there wouldn't be any problem. A democratic majority of Pan Blue citizens on Taiwan know otherwise. They know the real war-mongers in the Taiwan Strait are Taiwan's Quisling nomenklatura. They know that peace in the Taiwan Straits is the last thing the Taiwan independence nomenklatura wants, because genuine peace would deprive them of their key to political power, an "external" enemy. Pan Blue citizens' views however, are pointedly ignored by the US government and the US major media, because they fail to jibe with US "national interests," which should not be confused with the interests of ordinary US citizens. The following April 16, 2004 Central News Agency news report entitled "KMT-CHINA 'PEACE ACCORD' HARMFUL TO TAIWAN: DPP," provides an example of how fearful the Taiwan independence nomenklatura is that peace might break out in the Taiwan Straits! One is tempted to laugh out loud, except that the issue is much too serious. Taipei, April 16 (CNA) The opposition Kuomintang (KMT) will seriously damage the national interests of Taiwan and create international misunderstandings if it is to sign a "peace accord" with [mainland] China, ruling Democratic Progressive Party... said Saturday... referring to an upcoming visit to China by KMT Chairman Lien Chan, during which Lien reportedly might seal a "peace accord" with the Communist Party of China (CPC) to officially end the KMT-CPC civil war that lasted around two decades on [mainland] China before the KMT fled to Taiwan in 1949. [The DPP] warned that... signing a "peace accord" with Beijing at this point will reduce the Taiwan issue to an internal affair of China... it will feed Beijing's bid to eliminate the government of Republic of China and downgrade Taiwan to... a locality under the People's Republic of China if the "peace accord" is to be signed for the purpose of ending the "civil war." George Orwell's dystopian political novel "1984," written in 1948, alluded to political patterns manifest in the post WWII world, and political patterns emerging in the coming Cold War world. To see just how prophetic Orwell was, scan the following passages from Chapter 9 and compare them with today's Taiwan. The correlation is positively uncanny. Brief edits, in brackets [ ], have been made to underscore my point. When war is continuous there is no such thing as military necessity. Technical progress can cease and the most palpable facts can be denied or disregarded... researches that could be called scientific are still carried out for the purposes of war, but they are essentially a kind of daydreaming, and their failure to show results is not important. Efficiency, even military efficiency, is no longer needed. 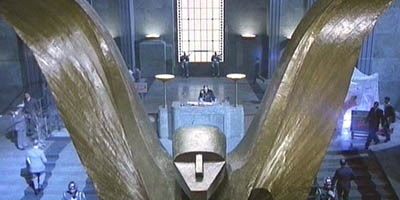 Nothing is efficient in [the "sovereign and independent Republic of Taiwan"] except the Thought Police. [The ROT] is in effect a separate universe within which almost any perversion of thought can be safely practised. Reality only exerts its pressure through the needs of everyday life -- the need to eat and drink, to get shelter and clothing, to avoid swallowing poison or stepping out of top-storey windows, and the like. Between life and death, and between physical pleasure and physical pain, there is still a distinction, but that is all. Cut off from contact with the outer world, and with the past, the citizen of [ROT] is like a man in interstellar space, who has no way of knowing which direction is up and which is down. The rulers of such a state are absolute, as the Pharaohs or the Caesars could not be. They are obliged to prevent their followers from starving to death in numbers large enough to be inconvenient, and they are obliged to remain at the same low level of military technique as their rivals; but once that minimum is achieved, they can twist reality into whatever shape they choose. The war, therefore, if we judge it by the standards of previous wars, is merely an imposture... But though it is unreal it is not meaningless. It... helps to preserve the special mental atmosphere that a hierarchical society needs. War, it will be seen, is now a purely internal affair. In the past, the [KMT] did fight against [the CCP]... In our own day [the DPP is] not fighting against [the CCP] at all. The war is waged by [the DPP] against its own subjects, and the object of the war is... to keep the structure of society intact... This... is the inner meaning of the [DPP] Party slogan: War is Peace. George Orwell's uncannily prophetic political novel "1984"
Lien Chan and a democratic majority of Chinese citizens on Taiwan want to end this imposture once and for all, so they can get on with living their lives. Chen Shui-bian and Taiwan's Quisling nomenklatura, on the other hand, want to keep waging this war against their own subjects, to keep the structure of society intact, and to keep themselves in positions of power.